This Is A Fully Furnished Studio Apartment In A Secure Building. It Features A Full Kitchen, Bathroom, Walk In Closet And A 'murphy Bed' For Maximum Living Space. There Is A Partial Ocean View From The Unit. The Building Features A Salt Water Pool, Full Laundry Facilities, A Work Out Room And Sauna. 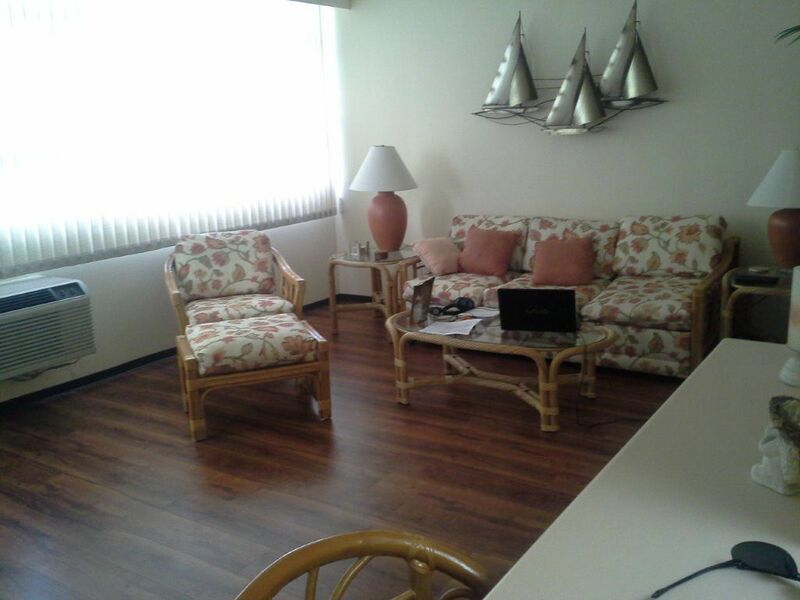 This Is The Ideal Location For Relaxing, Studying Or Working From Home. It Is Walking Distance From All Waikiki Attractions. We have two condos in this beautiful building. We are confident you will love staying so close to Waikiki in one of our units. This is the only residential property located on Waikiki Beach. Full kitchen, laundry and salt water pool in a secure building steps away from the beach. Partial Ocean View from Unit. Building is across the street from Waikiki Beach. Full laundry room access one floor away. Large and small dryers in laundry room. Full kitchen with stove, microwave, toaster, coffee maker, pots, pans, utensils and dinner ware. Breakfast Bar separates kitchen from living room. Secure pool area for building tenants and guests only. This building is uniquely close to the beach. The building is a quiet, secure environment perfect for relaxing or working from home. This was my 3rd stay in the building, 2nd in unit 305. SInce I knew what to expect everything was fine for a single guy who does not cook. I like being on the beach where I could be a tourist again. I did the Blue Note jazz club and that was very entertaining. Management of the suite is unquestionable. Whatever the issue or concern, it is addressed immediately. Location, amazing. Comfortable and perfect for the Waikiki experience. I will book with Ron again. A beautiful maintained old building located on Waikiki beach. Large studio w/ plenty of room. Very quiet for sleeping and friendly staff. We really enjoyed staying here. I recommend it. Convenient to everything you need in Waikiki. Well maintained building - everyone was so friendly. Highly recommend! Located steps away from the famous Waikiki beach with plenty of water sports, entertainment and restaurant choices. It's perfect for the extended business traveler or vacationer. The unit was clean and comfortable. It was a little dated but functional and fully stocked with daily necessities. Building security was excellent. So, for the value, location, functionality, and comfort, it was well worth it.The on-site manager, Vicki (with her husband Don) and the building staff were friendly, courteous., and helpful. The owner, Ron, was accommodating and very professional; great to work with. I had no problem in extending my stay for another week. I'll definitely stay again and will recommend the unit to co-workers, relatives and friends who plan on a longer stay. Property is at Waikiki Beach. 1/2 mile walk to the zoo, aquarium and Kapiolani Park. Credit Card fees are 2.5% for US cards and 4% for international cards. Fees may be deducted from your $500 deposit at the end of your stay.